DFWCityhomes is an established flat fee MLS listing service and full service real estate company that represents buyers and sellers in Waxahachie, Texas at a fraction of the cost. Our clients receive a full service experience with agent representation at all service levels and our simplified process is hassle free, proven, and effective. Interested in learning more? Click MLS Listing Services or Buyer Rebate Services to see how we may help you. Contact Us or Call (214)-207-0210 and we will explain to you how our services can save you time and money. Waxahachie, Texas is known as the Gingerbread City because of its many old historic Victorian homes. The city has also been designated as the Crape Myrtle Capital of Texas by the Texas Legislature. Waxahachie is proud of its historic downtown with many antique shops and outstanding restaurants. Waxahachie ISD offers children an outstanding variety of educational opportunities from academics to the arts, music and athletics. 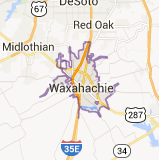 Waxahachie is the county seat of Ellis County, Texas, United States, and lies just beyond the southern suburbs of Dallas. The population was 29,621 at the 2010 census.